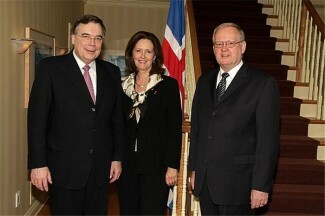 Honourable senators, I draw your attention to the recent visit of Icelandic Prime Minister Geir Haarde to Canada. Prime Minister Haarde’s first stop was in Newfoundland to meet with Premier Williams and co-sign a wide-ranging memorandum of understanding covering business and industry cooperation, cultural and academic exchanges, technology transfer and marine science. Mr. Haarde was also invited to speak at Memorial University, where he talked about Iceland’s remarkable progress over the past 15 years, which has led to its rise to the top of the 2007 United Nations Human Development Index. Mr. Haarde arrived in Ottawa and was hosted by Ambassador Markus Antonsson on April 17. He then met with Prime Minister Harper, and the two leaders discussed an upcoming bilateral agreement on security and defence cooperation, which is expected to be prepared for signing in the next few months. The two leaders also spoke about the recently signed free trade agreement between Canada and the European Free Trade Association, and cooperation at the Arctic Council. The relationship between our two countries has never been better and will strengthen in the years ahead. This week, Iceland’s Minister of Fisheries and Agriculture, Einar Gudfinnsson, is in Winnipeg meeting members of the Icelandic community and promoting increased ties between Iceland and Canada. He will tour Winnipeg, Gimli and Selkirk with Consul General Atli Asmundsson before flying to Toronto to return home on the inaugural direct flight from Toronto to Reykjavik on May 2. This direct flight is a result of the open skies agreement signed by Canada and Iceland last year, and offers another link between our two nations. I hope honourable senators will take the opportunity to use this flight soon. Honourable senators, I am obviously very pleased with the excellent relationship and ongoing cooperation between Canada and Iceland on issues of mutual importance and concern. I look forward to future initiatives that will further develop and strengthen our close ties with Iceland. In closing, I recognize an upcoming event dear to my heart showcasing Canada-Iceland ties, namely the Icelandic Art Festival. This festival, in its second year, celebrates the contemporary artistic and cultural connection between Canada and Iceland. Nuna, which means “now,” is part of the Canada Iceland Arts Festival Inc. and is curated by a committee of young Manitoba artists, writers, musicians and filmmakers. This year’s festival will run from May 6 to May 11 in Winnipeg and Gimli. The program features many things, including films, a performance by an Icelandic rock group, classical singing, visual art, collage, parties and dance. I congratulate Nuna (now) organizers and Manitobans for their excellent work in coordinating this festival and wish them great success. The Senate of Canada is one of the main components of the Canadian Parliament along with the House of Commons and the Monarch represented by the Governor General. © 2013 - 2019 Senator Janis G. Johnson. All rights reserved.